Was Bhagat Singh shot dead? 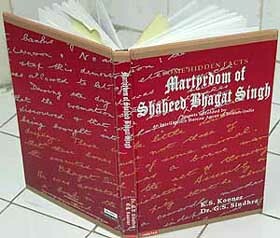 A new book on India’s most famous revolutionary who was hanged by the British on March 23, 1931, claims to have unearthed “hidden facts” showing that Bhagat Singh was not executed by hanging. Chaman Ahuja examines the facts revealed in the book. In Punjab, the spirit of Bhagat Singh is rising again: preparations have started to organise big events to commemorate in a befitting manner the 75th anniversary of his martyrdom on March 23, 2006, and his birth centenary the following year, on September 28, 2007. The recent visit of the Indonesian President, Susilo Bambang Yudhoyono, opened a new chapter in the relations between Indonesia and India. The president’s name is of Sanskrit origin. India’s success in technology, sustainable economy and education has impressed Indonesia. A new heritage train on the lines of the luxurious Palace on Wheels will soon ramble through Rajasthan. The Rajasthan Tourism Development Corporation, in collaboration with the Railways, will start this new train “Heritage on Wheels” to tackle the rising number of tourists in the state, official sources said. Peter Morley was once the golden boy of ITV. As a television director of just four years’ experience he flew to Munich in 1959 to carry out the only his pilot. The resulting programme, Tyranny-the Years of Adolf Hitler, the first one-hour documentary on the comparatively new ITV, won 10 million viewers. In the 1970s, the subject in B. R. Isharaa’s Chetna and its portrayal scandalised staid cine buffs. The most talked about, and "retailed", scene in the Press was a pair of uncovered female legs framing Anil Dhawan’s visage. The movie savagely shook the existing cinematic canon, but failed to impel the mainstream cinema to follow suit, albeit temporarily. La Planista or The Piano Teacher is centred on Erika (Isabelle Huppert), a hard-as-nails disciplinarian who teaches at the famous Conservatory in Vienna and also gives lessons at home. She is single and lives with her equally strong-willed mother (Annie Girardot). The audience for Indian movies abroad is at least 10-million strong. An online channel for film buffs worldwide will be launched next year. Film buffs worldwide will soon be able to download digitised versions of Indian movies from an online channel that will be launched in Mumbai next year. G.V. Films Ltd., a production house associated with many south Indian hits and some Bollywood ones too, will launch the facility to satisfy the voracious global demand for Indian movies. Remember Aamir Khan’s hit number Aati kya khandala in Vikram Bhatt’s Ghulam? Seven years later he’s back at it with another full-fledged song in Rakeysh Mehra’s Rang De Basanti. Aamir’s singing was so good in Ghulam that even Lata Mangeshkar had commented on how tunefully Aamir sang the Jatin-Lalit number. P. K. Vasudeva. Pearson Education, Delhi. Pages 530. Rs 599. Mandeep Singh and Harvinder Kaur. Deep and Deep. Pages 292. Rs 480.
ed Ram Puniyani. Sage Publications, New Delhi. Pages 332. Rs 380.
by Michael Buckley. Illustrated by Peter Ferguson Abrams, Harry N Inc. Pages 284. $ 14.
eds Geetanjali Mishra and Radhika Chandiramani. Sage Publications. Pages 313. Rs 350.
by Orhan Pamuk. Translated from Turkish by Maureen Freely. Vintage Books, a division of Random House. Pages 425. US $14.95.